Born at Monfort-sur-Risle, Albert Lebourg entered the École des Beaux-Arts of Rouen at a very young age. He was noticed in Rouen by the collector Laperlier who referred him to be appointed as a drawing professor at the Société des Beaux-Arts in Algiers. He was influenced there by Jean Seignemartin who helped him bring more clarity and light into his paintings. He married in 1873; the young couple remained in Algiers until the summer of 1877 when Lebourg resigned his teaching post and returned to Paris with numerous canvases of the Admiralty, the casbah and mosques. 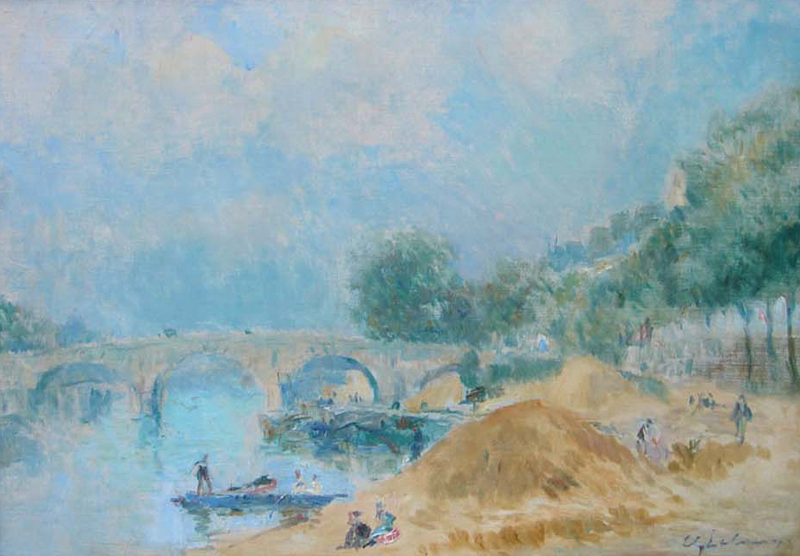 The Seine in the outskirts of Paris, with its countless subjects, kept Lebourg occupied in all seasons. He continued to paint in Auvergne, Normandy, and Ile de France. From 1888 to 1895, Lebourg settled in Puteaux, where he availed himself to the surroundings of Paris. He wrote at the time: “I will paint often at the banks of the Seine: Nanterre, Rueil, Chatou, Bougival, Port-Marly. These are a source of themes and very beautiful landscapes”. At that time, he painted what he regarded as his best paintings. He moved to the Netherlands in 1895-1897 exhibiting with the Mancini Gallery in Paris to great acclaim. In 1900 he won the Silver Medal at the Exhibition Internationale Universelle. In 1903 a retrospective was organized featuring 111 works at the Gallerie Rosenberg. He continued to exhibit at the Nationale Salon annually with his fame firmly established by 1910. Yet another retrospective was organized in Paris by 1918. In September of 1920 he suffered a stroke that paralyzed the left side of his body. Nevertheless he remarried the next February in 1921! A Catalogue Raisonné was organized that year that included 2,137 works and was released in 1923, which garnered united praise by the press. The year of 1926 bid farewell to the last of the great impressionists: Charles Angrand, Mary Cassatt and Claude Monet; in 1927: Albert Guillaumin. Albert Lebourg died in Rouen on January 7, 1928. Albert Lebourg’s works are in many museums: the Musee d’Orsay, Petit-Palais and Carnavalet in Paris, as well as museums in: Bayonne, Clermont-Ferrand, Le Havre, Dunkerque, Lille, Strasbourg, Sceaux and above all Rouen (Depeaux collection).